When it comes to Aaron Hernandez, he was one of the best tight ends in the NFL and the New England Patriots can’t stop praising his ability on the field. 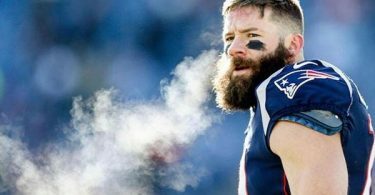 CelebNSports247.com reports Stephen Anderson feels that its odd that a player with such a tragic story is still being used to both motivate and educate the Patriots’ tight end unit. 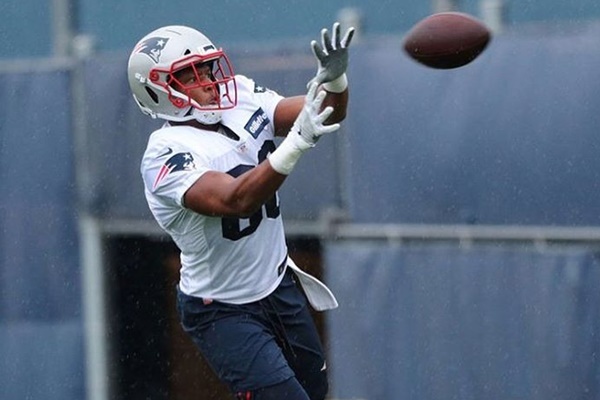 Stephen Anderson has taken the advise and has been watching old footage of how Aaron Hernandez moved on the field to better his game. Though, he still finds it weird that Hernandez is still included in a list of players to model his game around is certainly an interesting tactic. Apparently, Belichick is trying to focus on the highlights of Hernandez’s NFL career, rather than his off-field transgressions. 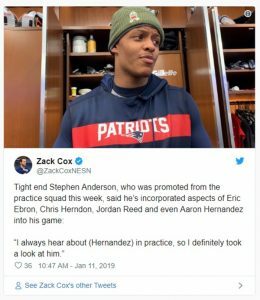 With the Patriots set to take on the Kansas City Chiefs in the AFC Championship Game on Sunday, few probably expected Hernandez to be a topic of conversation in the New England locker room. Still, it’s hard to ignore such a dramatic story that stems straight from the team’s locker room, according to 12Up.